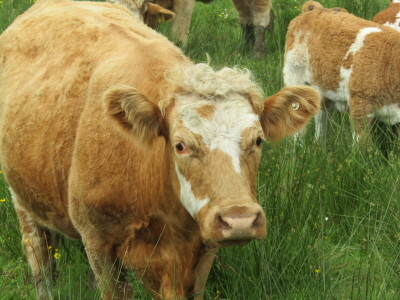 Gentle faces from my trip to Ireland. Both from Sherkin Island. I do so love their eyelashes. The cats came running as soon as the ferry arrived at the pier. We followed our guide toward the Bank House, tiny Whiddy Island’s main – make that only – pub and hub, and two wild, furry little characters begged for pets and scritches. I was over the moon. I had been in Ireland a few days and hadn’t seen a cat yet. Sheep, cows, seals, eagles, chickens, horses, donkeys and dogs, yes. And yes, those beasties made this animal-lover happy, but cats are special. Because my name is Rondi and I am a cat lady. When I lived in Istanbul I would have to factor in at least an extra half hour for my morning trek to work, to accommodate all the time spent stopping to cuddle local cats. At a kibbutz in Israel I took fish from the breakfast buffet and fed it to the feral colony outside. When I visit Paris, I make my way to Montmartre Cemetery to see the feral colony that sleep on Truffaut and Stendhal’s tombs. When I visit Rome, I hightail it to the Protestant Cemetery and commune with the cats who contemplate life at Keats’ grave and who nap on top of Gramsci’s eternal resting place. Rome, of course, has plenty of feline activity, including the famous shelter which borders the Roman ruins near Torre Argentina. The great and glamorous Anna Magnani used to feed the cats in the area when she was performing at the Teatro Argentina, long before the creation of the current shelter. I’ve never turned to a cat out of loneliness. I just find they are frequently better company than humans, and like Ernest Hemingway, I believe that one cat always leads to another. 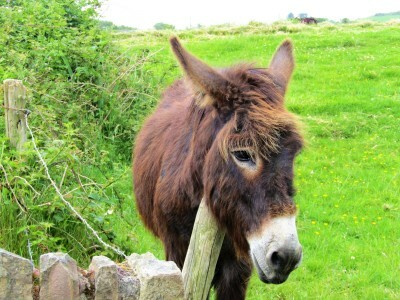 I’m not a spinster and I am (mostly) not dowdy, though I suspect I looked mighty dowdy during my recent trip to Ireland. I packed light as I can’t bear checking bags – too much lost luggage in my past – which meant my fellow travelers saw me in the same clothes more than they might have liked. It also meant that I neglected to bring my flat-iron. In other words, crazy-haired woman steps off the pier onto the soil of Whiddy Island and runs with delight into the paws of a couple of scruffy Irish cats. And there began a tale. Travel they say, opens your mind to different peoples and cultures. It can and sometimes does, though I’ve often found it merely confirms what you already know. If it’s effective, it opens your mind to a bit of how you can be when you’re not at your best, to some of your less attractive traits. This is what happened to me on Whiddy Island. Whiddy is a wee spot (5.6 kilometres long and 2.4 kilometres wide) off the coast of County Cork, Ireland. Ferries leave Bantry pier for Whiddy several times a day in summer months and less frequently the rest of the year. The island has a permanent human population of 22, many of whom speak Irish and an animal population of more than 22, each of whom may or may not speak Irish. Two of the latter were those cats who came running. One was orange and white, the other a calico/tortoiseshell mix, so I knew she was a female. They were both old and thin, both highly affectionate and trusting, both desperate for every bit of contact the ferry full of tourists could give them. And both had dirty coats and ears that looked either frost-bitten or as if they had been torn during a street scrap. I wondered how much care they were getting. I don’t expect ferals, strays or even old cats to look as plump and happy as younger, indoor cats, but I was alarmed by their gritty coats and bony frames. The more time I spent with the female – “the little old lady” was how I began to think of her — the more upset I got. She was having trouble walking, and her breathing sounded raspy. 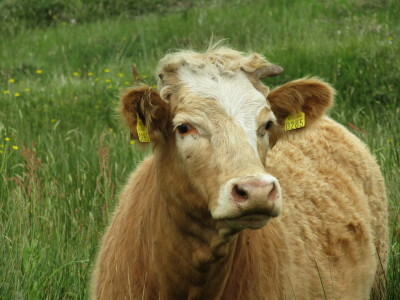 I know that rural life is different than urban life – for humans and non-human animals alike — but I was worried. I hoped my tone was caring, but in retrospect I think it far more likely to have been accusatory. Why, I asked our tour guide, aren’t they being fed? These cats are helping control the mouse and rat population; people should be grateful. 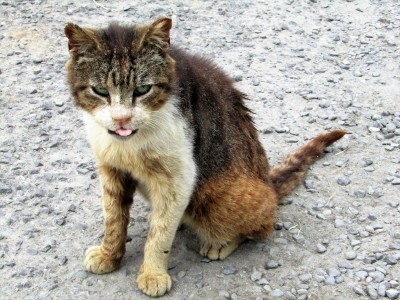 What I didn’t mention was that I have worked for years for a cat rescue in Toronto and have seen cats in worse shape, as I had seen cats in worse shape in Istanbul. But the difference in both cases was that in Toronto and Istanbul, I could do something. I felt powerless in Ireland, and frustration compounded my concern. 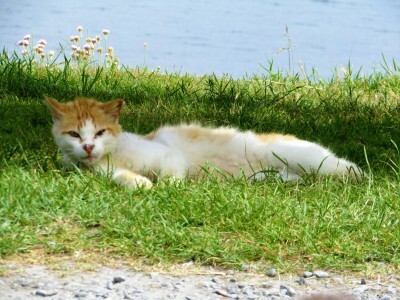 As we continued our tour of the island, I kept wondering whether I could commandeer a boat and take the cats to the mainland for a veterinary visit. I couldn’t, and as we left, I saw the little old lady and her orange and white friend sitting in the tall grass, sunning themselves. I had to admit they looked contented. Still, our wonderful guide promised to do what she could to investigate, and if needed, help. Back in Canada, I downloaded my photographs. Calmly looking at images allowed me to see what I had missed in the frenzy of activity on the island: both cats had tipped left ears, rather than what I had initially thought (though the calico had a ragged right ear, as well). 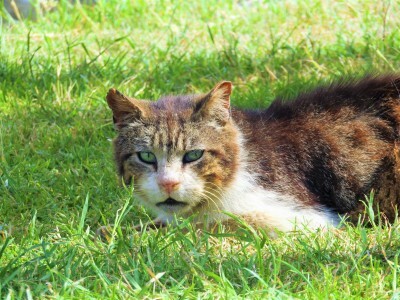 Ear-tips are an international sign of TNR, or trap/neuter/return, indicating that feral and stray cats have been spayed or neutered. Relief flooded in, along with some embarrassment. I don’t think it was wrong of me to have been upset, or to have intervened. Too many ignore animal suffering. But I had ascribed negligence, or worse, where there was none. I had made assumptions without finding answers. Casting blame first is not helpful. Where there is doubt let me sow faith; where there is darkness, let me sow light, as the prayer of St. Francis – patron saint of the animals — says. I found, through the wonders of the internets, the rescue group responsible for the area. I discovered that the Whiddy cats were fed by locals and given as much care as possible, considering the geographic limitations of island life. I struck up an online conversation with one of the rescue’s volunteers and learned that the little old lady was simply that – a very old lady no longer in the bloom of her youth. 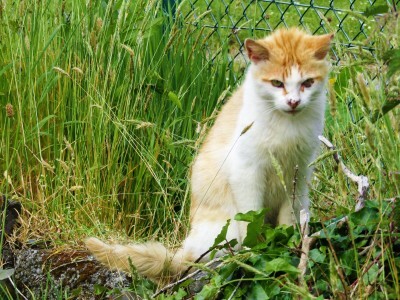 A few days later a message from my tour guide – who had indeed reached out for help and information about the cats of Whiddy — brought sad news: my calico friend had died peacefully shortly after our visit. I’m grateful to have met her and to have learned from her. May she rest in peace and may she cuddle up for eternity on the lap of Anna Magnani. Had a wonderful whale-watching experience earlier this summer off the coast of Ireland. I referred to it in my travelogue for Go World Travel. 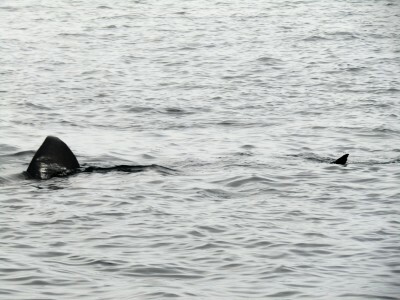 What follows are a few photos – I saw Basking sharks, Minke whales and Risso dolphins. I only got photos of the first two, and not great ones at that, but the experience was extraordinary. 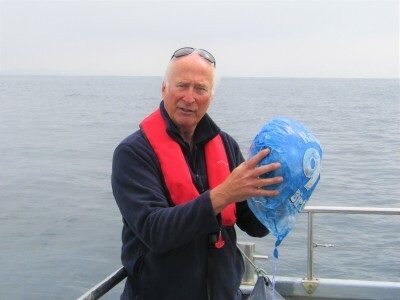 We also saw – most unfortunately – how much plastic there is floating around out there. 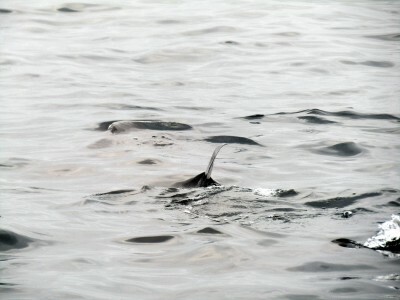 First two photos are the Basking shark, or rather, his fins. Cannot impress upon you all how goose-bumpy it was to see him swimming about with his mouth wide open, something I didn’t capture in the photos. 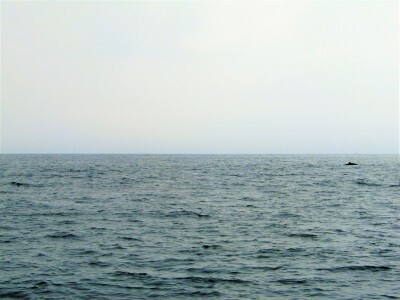 From a distance, a Minke whale, frolicking. Handsome Captain Nic Slocum, with a stupid balloon pulled out of the water near our boat – seriously people, rose petals are just as good for a birthday celebration, and won’t hurt any living creatures. Please check out Whale Watch West Cork (link above) for tours around the world, including here in Canada.